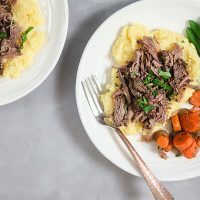 Slow Cooker Red Wine Beef over Horseradish Polenta | Healthy. Delicious. 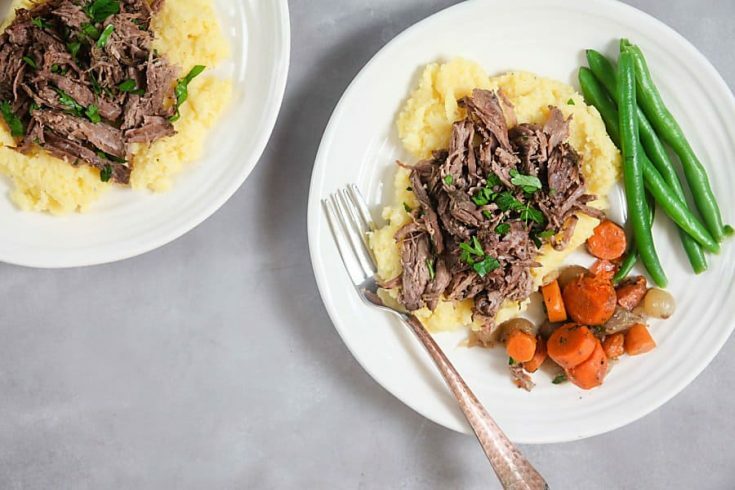 Slow cooker red wine beef, served over creamy horseradish polenta, is a great recipe for snowy winter nights. It’s easy enough for busy weeknights, but is also perfect for entertaining. Monday night dinner party, anyone? This is the second in a series of recipes I created for Moyer Beef. Moyer can be found in many Tops Friendly Markets across the Northeast. Lately, Monday nights have become slow cooker night at our house. Shawn and I go to a late class at the gym and by the time we get home: 1) I’m starving and 2) the last thing I feel like doing is spending a ton of time in the kitchen. Until we had the idea of pulling the slow cooker out we would stop and grabbed something to eat on the way home, which kind of defeated the point of going to the gym in the first place. Now, we look forward to a healthy, home cooked meal waiting for us when we get home. 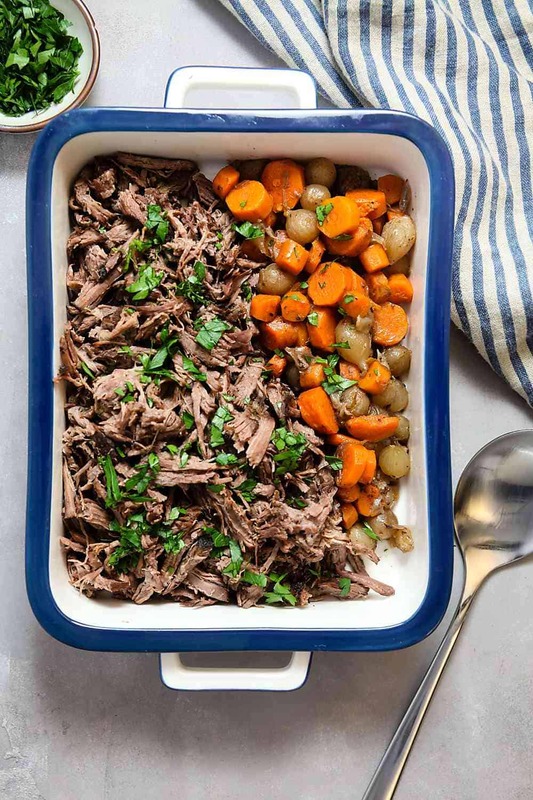 Chili and soup are on frequent rotation, but when we’re in more of a “meat and potatoes” kind of mood, this slow cooker red wine beef does the job. It also makes an amazing Sunday dinner and is great for entertaining – your guests will never know how easy it actually was! 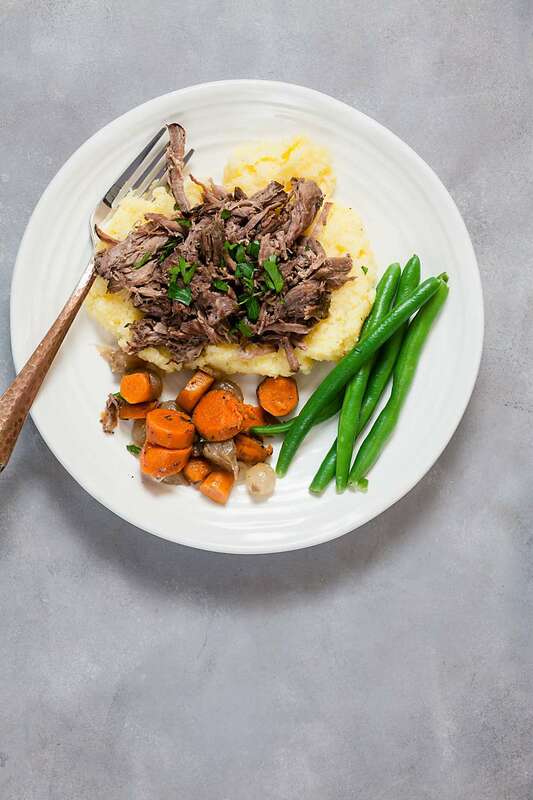 For this slow cooker red wine beef recipe, start with a three pound chuck roast. (A little bit bigger or smaller is ok, just look for a roast around that size.) I used a roast from Moyer, a brand that sources USDA grade Prime or Choice beef from small family farms in New York and Pennsylvania. (You can read about my visit to one of their partner farms here.) 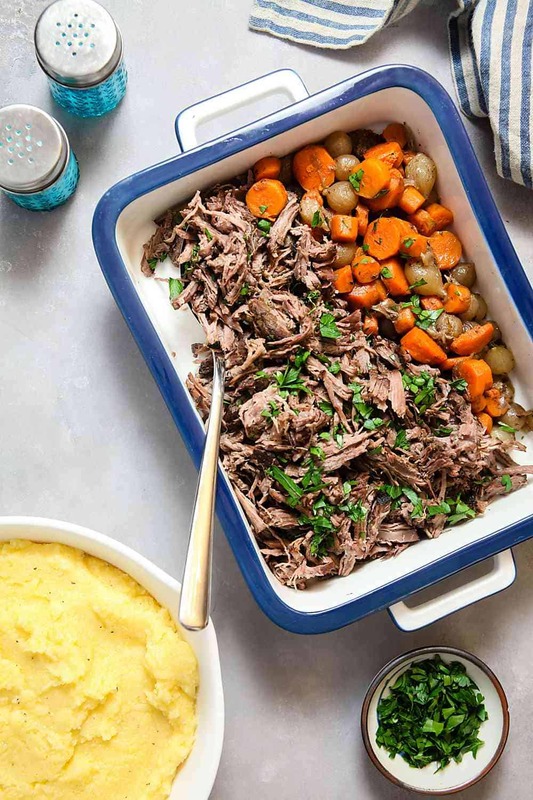 Chuck is a great cut to use in slow cooker recipes because it has a rich, beefy flavor and cooking for a long time in liquid makes it super tender. Pat the roast dry with paper towels – a dry surface helps the meat brown beautifully – before seasoning it liberally with salt and pepper. Then sear it in a hot pan until a golden brown crust forms. Don’t worry about actually cooking the roast at this point, you just want some of that delicious browning to help develop the flavor. Once the roast is beautifully browned, transfer it to the slow cooker along with red wine, vegetable stock, carrots and frozen pearl onions. You could also use two sliced onions, but I love the flavor and texture of pearl onions (plus they’re Shawn’s favorite, so I get bonus points for making them.) Let it cook all day long until the vegetables are super tender and the meat starts to fall apart. 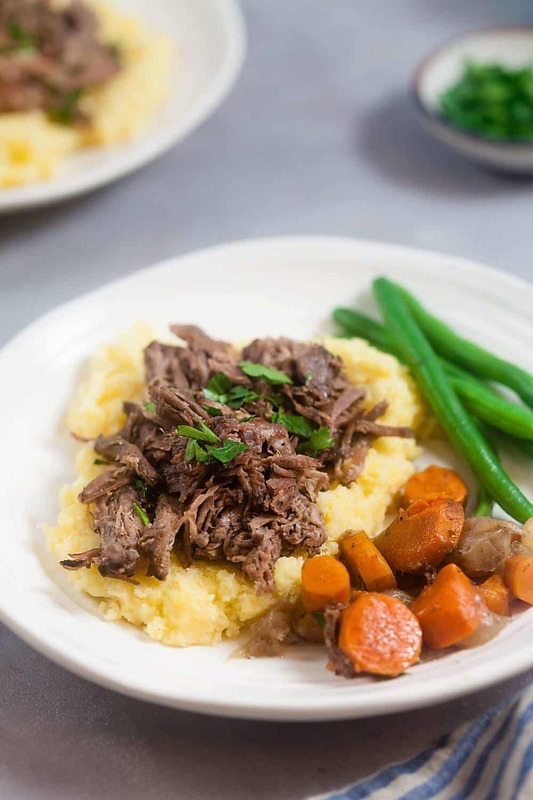 My favorite way to serve this slow cooker red wine beef is over creamy horseradish polenta. It’s a nice change from something more expected, like mashed potatoes, and is super easy to make. I also love how the sharp flavor of the horseradish contrasts with the rich beef. 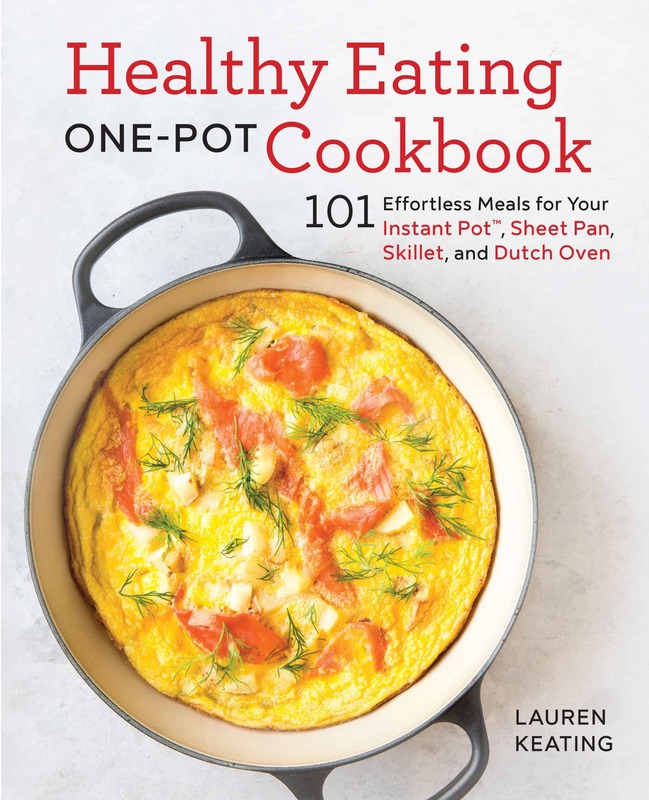 When you’re just about ready to eat, bring a big pot of water to boil for your polenta. I take advantage of the time it takes to boil that water and use it to shred the beef. Sometimes I’ll also cook a few green beans or another vegetable. Once the water is boiling, add the polenta and salt. It cooks fast! Cook, stirring frequently, until it solidifies into a porridge and starts to pull away from the sides of your pot. Remove it from the heat and stir in butter and prepared horseradish. I use enough to get a hint of horseradish flavor without being too overpowering or spicy; you can add more if you prefer a stronger flavor. 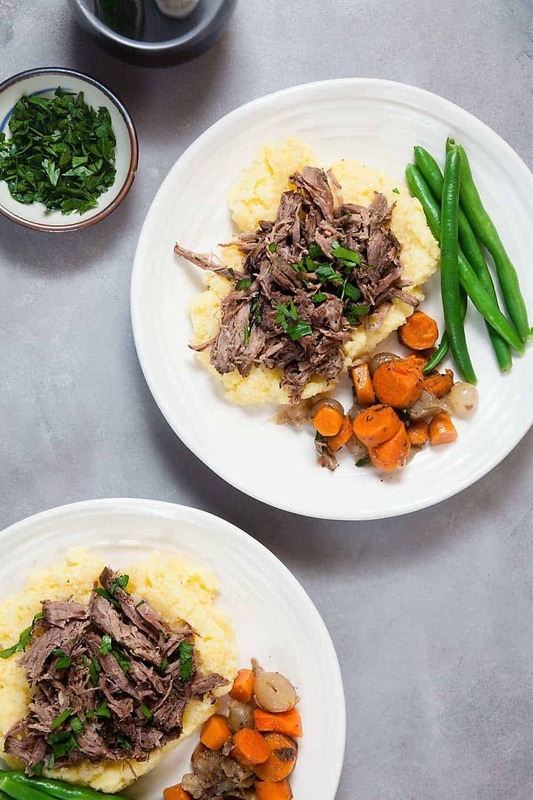 Spoon the polenta onto your plates and top with the shredded beef. Serve the vegetables on the side. Pat the chuck roast dry with paper towels, then generously season it with salt and pepper. Heat the olive oil in a large frying pan set over high heat. When the oil begins to shimmer, add the roast to the pan. Sear for 4-5 minutes on each side, or until deeply browned. Transfer the roast to a slow cooker. Add the garlic cloves, carrots, onions, wine, and stock. Cook on low for 8-10 hours, or until the meat is falling-apart tender. Transfer the roast to a cutting board. Shred the meat, then drizzle it with some of the pan juices. Sprinkle with parsley and season with salt and pepper. Use a slotted spoon to transfer the vegetables from the slow cooker to a serving dish. Prepare the polenta immediately before serving: Bring 6 cups of water to boil in a large pot. Add the polenta and 1 teaspoon salt. Cook over medium heat, stirring frequently, for 3 minutes, or until the polenta begins to pull away from the edges of the pot. Remove from heat and stir in the butter and horseradish. This was absolutely amazing! I did add a bit of cheese to the polenta because I can’t resist but otherwise follow to a T and you will not be disappointed! 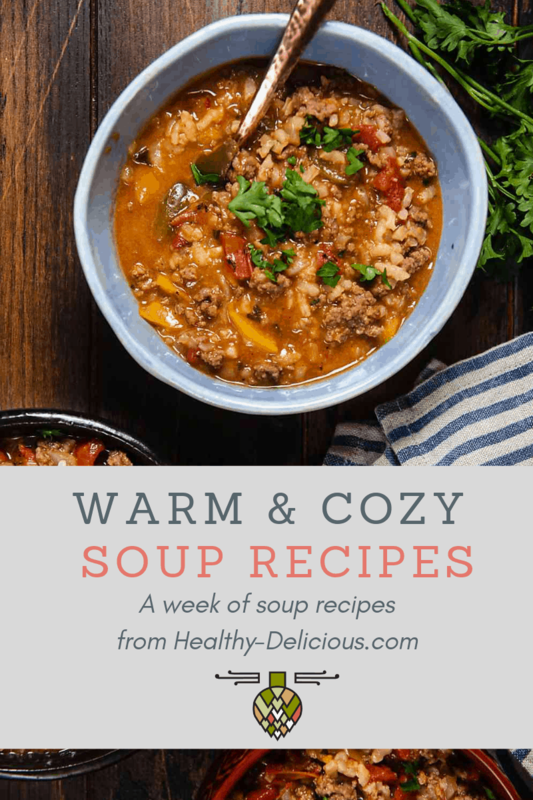 I’m a big fan of comfort food, and this looks amazingly delicious!